If you do not quite fit in the twin-XL bed provided by the dorms, stress no further. Students may be able to rent full-sized beds for their dorm rooms starting as soon as spring 2019. For $300, the company Roomie Rentals offers a full-size bed frame attachment, a memory-foam mattress, and the delivery and set up of the bed attachments before students move in. The company was connected to Rollins through Kevin Larrivee (‘19), who is the subsidiary owner of a company branch. Although the Rollins branch has yet to be named, or even approved, Larrivee said he is hopeful of the company’s success at Rollins. The status of this company coming to Rollins is uncertain. Larrivee is waiting for the approval of the Office of Residential Life and Explorations (RLE). “We’ve asked for a set of references from other schools that are using it,” said Leon Hayner, director of RLE. “They’ve provided a few, but we’re asking for a few more so that I can talk with directors of residential life at other schools to see how the product is working; if it’s safe, if students are enjoying the service they’re getting, if the service is of high caliber.” After the evaluations, Hayner said they will review the idea with other college administrators. Outside of Roomie Rentals, full-size beds will most likely appear in the new upperclassmen residence hall which is in the works to be built next to McKean Hall on the shore of Lake Virginia, according to Hayner. “Part of the planning…is to include full-size beds because we’ve heard very clearly from our students that a full-size bed is something they do want, particularly for those students who are going to be living in an apartment-style upperclassmen residence halls,” said Hayner. 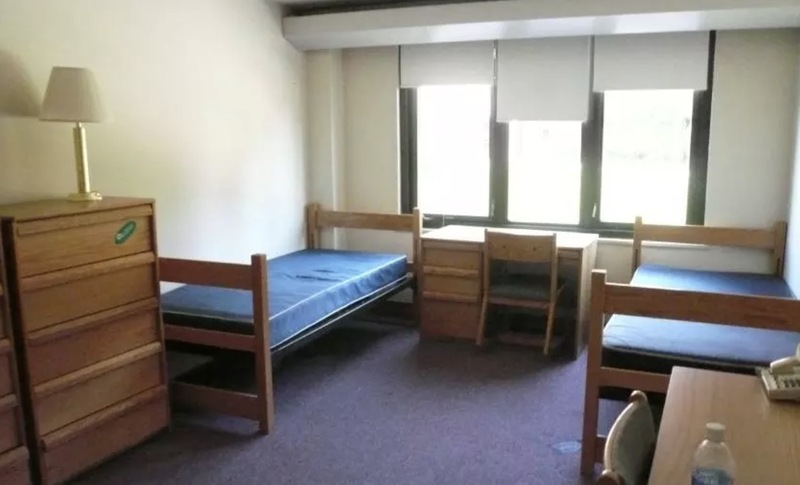 One of Hayner’s concerns is whether there will be “enough room in the residence halls that are traditional doubles for both students to have a full-size bed.” According to the dimensions provided by Larrivee, the mattress sticks out seven inches on each side of the original bed frame, making it the same length as a twin-XL. Moreover, people have raised questions about how sanitary it is to rent a mattress. “Once the mattresses go back to storage for the Summer, they are stripped of their outer casing (which already prevents most bacteria/bed bugs from seeping into the memory foam part of the mattress),” Larrivee said in an email. “The memory foam mattress is run through an infrared heater which kills off any possible remaining bacteria/bed bugs that may have found their way through the outer casing. A new outer casing is then placed on the mattress, it is shrink wrapped and then placed in a box and stored in a clean facility until it is needed by students again the next year.” There is a new outer casing on it each year, yet the mattress still goes through an intense cleaning process. Policies are arranged if student’s plans go awry. “If the moving team shows up and is unable to set up the mattress for any reason, students will receive a full refund and be given a free twin-XL memory foam topper for the inconvenience,” said Larrivee. For a more affordable option, Larrivee said they plan on offering students the option of purchasing a twin-XL memory foam topper at a reduced rate. Roomie Rentals was founded by three Dartmouth alumni in 2012 and is now active in around 30 schools around the country. Colleges like Brown, Bates College, and Dartmouth appear as partners on their website. They use campus ambassadors to promote their brand. Larrivee said the CEO reached out to him over email after he was recommended by someone in the business department. “They look at students with really good academic standings, and usually business majors,” he said. In addition, Rollins seemed like the perfect fit to the CEO because it is a small, private school with a three year live-on policy, he said. If students want to see this company on campus soon, Larrivee said, “Students should reach out to [RLE] saying that they really want a service like this.” The earliest he predicts Roomie Rentals would come to Rollins is spring or fall semester of 2019.